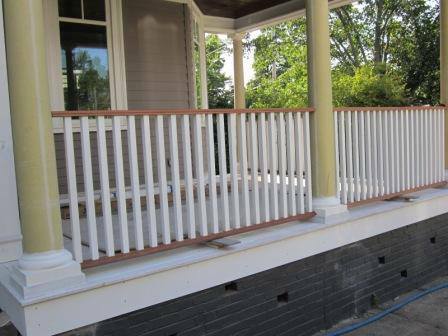 Here is another project completed in Rhode Island. The initial prognosis was to replace some rotten deck framing, but we discovered rot at the base of two other columns and rot in the handrail. The client also decided to replace the existing decking which we used tiger claw hidden fasteners to give the deck a more elegant look. So the resulting project was a completely new porch from the existing brick foundation up. Here are a few of the stained glass pieces we have been contracted to build. The door piece was for a property located in Southern Vermont, this includes a piece of roof slate at the center of the piece. The circular piece (which is still under construction) is a commissioned piece for a private client. We also restore existing stained glass windows to their former glory as needed. This renovation was done without the help of an architect. The client had a clear vision about what she wanted to achieve and we helped her manifest that vision. The original interior trim work was all heavily varnished clam shell door and window trim. The overall vision was to remove all the trim work, carpet , rebuild three bathrooms, a new kitchen and install new trim throughout the house with a new ash hardwood floor. Five years later we returned to remove the existing cedar shingle roof and replace it with clear pressure treated hand split cedar shakes from British Columbia. Here is a short video of a total interior restoration we completed in Providence Rhode Island. This video shows the mostly completed framing portion with the closed cell and blown in cellulose insulation.You will see that running a video camera is not one of our specialties so please excuse any video quality issues. Mickel was born and raised in New Zealand, where he began his training as a carpenter/joiner in 1985. He holds a level three New Zealand Certificate in Engineering. His carpentry apprenticeship, which included both theoretical course work and hands on building, lasted four years, and upon completion, he traveled to Holland where he lived for three years. While in Holland, Mickel was involved with many types of building projects. He spent 3 months restoring a 700 year old church in Amsterdam and helped to renovate existing warehouses into luxury apartments in downtown Amsterdam. For eight months, Mickel was involved in a project to build ten new houses, and finished his time in Holland bringing old houses up to new building code standards. Upon returning to New Zealand, he began his own business as an independent renovation contractor. In the past 15 years, he has completed projects ranging from historic restorations, additions, kitchen and bathroom renovations and complete interior remodels. Mickel worked at Wellington Polytechnic for three years training new apprentices and was involved in the new Pre Employment Carpentry course. In June 2003, he relocated to Southern Vermont, where he lives off the grid on thirty acres of beautiful wooded land. With twenty seven years as a full-time renovation carpenter and teacher he brings a love of his craft together with a high level of professionalism which is apparent both in his work and his workshops. Currently he teaches at Yestermorrow Design/Build School, and runs Real Life Renovation Workshops and Phoenix Hill Renovations.